The gall, in a one-year old shoot, is smooth, fusiform to barrel shaped, round in cross-section, smoothly fading into the ungalled shoot; the gall chamber is in the pith. The larva is solitary, pale orange, and pupates in the gall. Univoltine. 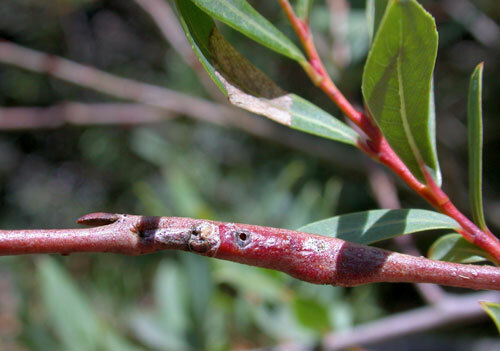 The eggs are glued in small group at the undersides of the very young leaves of a terminal bud, preferably the main shoot. The emerging larvae crawl towards a leaf base and from there penetrate into the shoot (Loux). Pupa frontally with a pair of spines. Dasineura degeerii; Rhabdophaga ramicola Rübsaamen, 1916. Barnes (1951a), Béguinot (2002h, 2012a), Buhr (1965a), Dauphin & Aniotsbehere (1997a), Gagné (2010a), Lambinon, Schneider & Feitz (2012a), Loux (1967a), Möhn (1955a), Redfern & Shirley (2011a), Roskam (2009a), Roskam & Carbonnelle (2015a), Rübsaamen (1916a), Simova-Tošić, Skuhravá & Skuhravý (2000a), Skuhravá (2009a), Skuhravá & Skuhravý (1997a, 1999a, 2003a, 2006a, 2009a, 2010a,b, 2012a), Skuhravá, Skuhravý & Hellrigl (2001a), Skuhravá, Skuhravý & Jørgensen (2006a), Skuhravá, Skuhravý & Meyer (2014a), Skuhravá, Skuhravý, Skrzypczyńska & Szadziewski (2008a), Stelter (1978a, 1989b).